While this confession seems to shock every person who meets me in the flesh, every so often I just feel the need to throw on an Asian double feature or host an impromptu Chow Yun-Fat mini-marathon to unwind with some of world cinema's finest (and often most violent) visual poetry in motion. Although as a critic I'll watch anything and it always makes me laugh when I meet another in this profession who makes blanket statements about an entire genre or refuses to watch something (since being open-minded is kind of in the job-description), Asian cinema is of particular interest. Relatives and close friends seem to attribute what they perceive is my strange fascination with “kung fu movies” (being that at heart, I'm still a polite, flowery, feminine, Caucasian native Midwesterner) to the fact that my high school had a very large Asian population and they're probably right. While elsewhere girls drooled over George Clooney and Brad Pitt and Leonardo DiCaprio's sacrifice to save Kate Winslet in Titanic made their hearts flutter, in one of my groups of friends, we analyzed the martial arts technique of Jet Li vs. Jackie Chan and I felt that Leo had nothing on Chow Yun-Fat's wish to give his eyesight to a singer (conveniently named “Jenny”) he'd accidentally blinded as a hitman in the end of John Woo's The Killer. So I guess you could say that even when he made some downright awful films like Bulletproof Monk and had to suffer the worst possible hair day that lasted throughout the entire running time of the brilliant Crouching Tiger, Hidden Dragon-- Clooney and Pitt were always second fiddle to a guy who could fly through the trees and help various Jens including Ziyi Zhang's in Tiger. 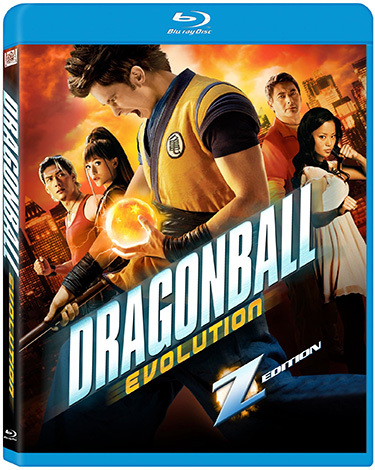 By this point you may be asking yourself why on Earth am I writing an ode to Chow Yun-Fat instead of a review of Dragonball Evolution but for the poor souls who have actually experienced the horror that was this film, you'll realize that my aim is simple and true. Yes, that's right, I'm reverting back to polite, flowery, Midwestern mode to avoid talking about the horror show that fans of the ridiculously popular series experienced in theatres this past Easter. Yet another work that (similar to GI Joe) was not screened for critics-- you can't imagine this adaptation of Dragonball being a hit with fans either as just a casual few minutes spent on IMDb browsing the comments section recently found some disgusted, disheartened devotees “of one of the most popular Japanese manga series of all time” calling for the filmmakers to be imprisoned, bankrupted, etc. However, my disappointment with the uninspired, lazy, and nonsensical work didn't reach those extremes. While admittedly having known about the nearly universal loathing of the work going in, I foolishly figured that in my case Dragonball ignorance would be bliss. How bad could it really be, I wondered? After all, Chow Yun-Fat was in it! Thus, I felt pretty hopeful since I hadn't been an ardent viewer of the television series, familiar with the source material, or well-versed in the minutia of the mythology to the extent of the fans who filled message boards and blog comment posts with their sense of injustice over how much the film from director James Wong, screenwriter Ben Ramsey and producer Stephen Chow deviated from the original works. Yet, just like I discovered with the vapid, vacuous, and very dull adaptation of The Spirit-- it didn't matter if you knew the origins or not since you could sense the film was in trouble pretty quickly after it began. In a nutshell and yes, feel free to go ahead and insert laughter right here-- basically the plot consists of a guy who wants to get his hands on some balls. 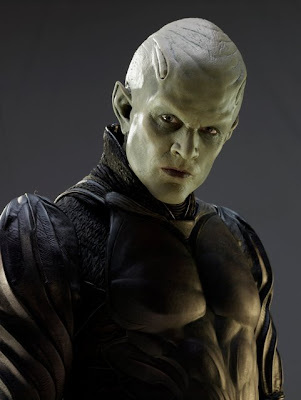 Okay, I'm over-simplifying... he needs balls to prevent an evil lord (played by Buffy the Vampire Slayer's James Marsters) from taking over the entire planet. 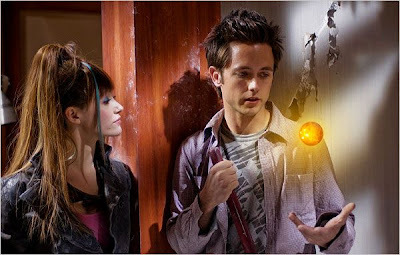 Of course, these aren't just any balls-- that'd be too easy and heck, you could solve that crisis by hitting the nearest store-- but seven mystical Dragonballs that have something to do with alien races, some of which are partially human including our eighteen year old lead Goku (Justin Chatwin). Raised by his grandfather who's keen on training him Mr. Miyagi-style to fight on what appear to be laundry clotheslines in the backyard, Goku is given a Dragonball on his eighteenth birthday. Yet instead of spending time with the old man who loves him, he opts to go to a party thrown by the beautiful Chi Chi (Jamie Chung). Ordinarily I'd insert a "trade one ball for other balls" style joke here but hey, man, this is a kids movie and darn it, he does learn a lesson when he returns to find his grandfather murdered. So of course Goku sets off on a quest to collect all of those specially marked balls and that's the rest of the movie! Imagine that in a pitch-meeting! It'd be like the scene in Glengarry Glen Ross involving balls but perhaps with glittery or bright colors thrown on them and minus Alec Baldwin. Anyway, back to the film: Along for the ride are the rebellious Bulma (Emmy Rossum) and her eccentric teacher (a wasted Chow Yun-Fat) and soon enough Chi Chi as well as others who show up in a few unexplained plot contrivances that the filmmakers hope they can distract you from dissecting too much. 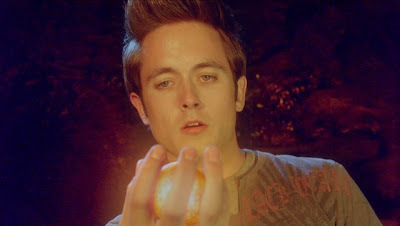 In doing so, they use CGI as a trick to sort of have us figuratively go along on the quest by following the "bouncing balls" of shiny eye candy with sight gags and special effects before you realize the film just doesn't make a whole lot of sense. Of course, those of us who have survived The Spirit, Speed Racer, and Bedtime Stories know how well that always works! 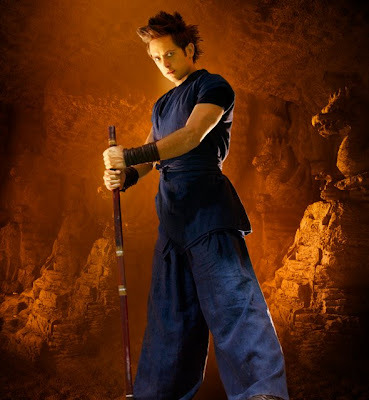 For the gaps in the film are huge and had I been an enthusiast of the Dragonball series, I'd be pretty upset with a movie that just looks like a green and blue screen exercise and a series of sequences pieced together that don't flow easily in the slightest aside from one killer fight scene wherein Chi Chi takes on herself. Although thanks to the Blu-ray's extra features, we realize that this sequence may have ultimately been conceived for cheap male titillation as the making-of scene finds the filmmakers making jokes to that effect of watching the hottest cheerleader in school in a catfight with herself is cool. However, sadly a few of those responsible for Dragonball still hold hope that this scene was of "make or break it" importance that would ensure whether or not fans were with them. Regrettably, the fact that it occurs almost 80% through the film, doesn't work with the rest of it, and is only memorable for wicked fight choreography just makes it a thumbs up (trademark Roger Ebert) on its own in spite of the picture. And again while I'm far from an expert and I'd never feel so extreme to suggest some of the wishes those commenting online are expressing and I'm sure there's a few kids out there who really "dig" the movie, basically I understand their frustration. For, instead of dollar signs, the filmmakers should've honored one of the most successful Japanese animated franchises in history by at least giving us some idea why it had achieved that status in the first place. Since appearance and depth wise, the work bears more in common with one of the Dragonball video games than the graphic novel series. However, per usual for Twentieth Century Fox-- it's a stellar presentation on Blu-ray as the studio has thus far failed to release a Blu-ray that wasn't at least a four out of five star value from a technical standpoint alone (save for perhaps Burn Notice Season 2 which looked a bit washed out). And to this end, the clarity of this Z Edition is top-notch. Understanding that its intended fan base would be in the iPod and portable device bracket, the Blu-ray comes complete with a digital file for precisely that purpose and the color and sound is well-balanced during the entire Blu-ray experience-- yet on a smaller screen the reliance on CGI seems even more magnified at times. There are some additional kid-friendly extra features like a video game and Goku's workout along with a couple of brief Fox Movie Channel ones on the making-of-the-film including that awesome Chi Chi vs. Chi Chi fight. Perhaps the most ironic extra is the one featuring the likable lead actor where he espouses the importance of storytelling to film school students despite starring in something that I'm wondering if even the Final Draft software may have questioned if the author really wanted to save. The 2-disc Blu-ray set also boasts a brief and humorless gag reel, a music video and deleted scenes just in case the 85 minute movie doesn't feel long enough...and yes that's irony once again as it felt like I was watching Lawrence of Arabia at times. While my first experience with Dragonball was undoubtedly a disappointment similar to the first onscreen pairing of Jet Li and Jackie Chan, luckily I can always go back to the original Dragonball source material or old Chow Yun-Fat movies to fall back in love with the splendor and quality of Asian cinema and storytelling. That is, of course, until the sequel is released. That's right, folks-- I'm sorry to say that the filmmakers set us up directly for this scenario to repeat itself nearly from the start, leading us into it in a series of fake endings until just when you think it's over after the credits have begun, there's one more “guess who's still around?” segment to ensure that this part sinks in... unlike the rest of the movie's plot about balls.